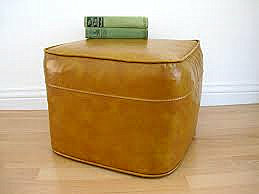 When I was growing up in the 1950's and early 1960's, hassocks and footstools were commonplace around the house. They were low to the ground and some had metal legs and vinyl or naugahyde tops. And some were solid spheres. Some had wooden legs and upholstered tops. 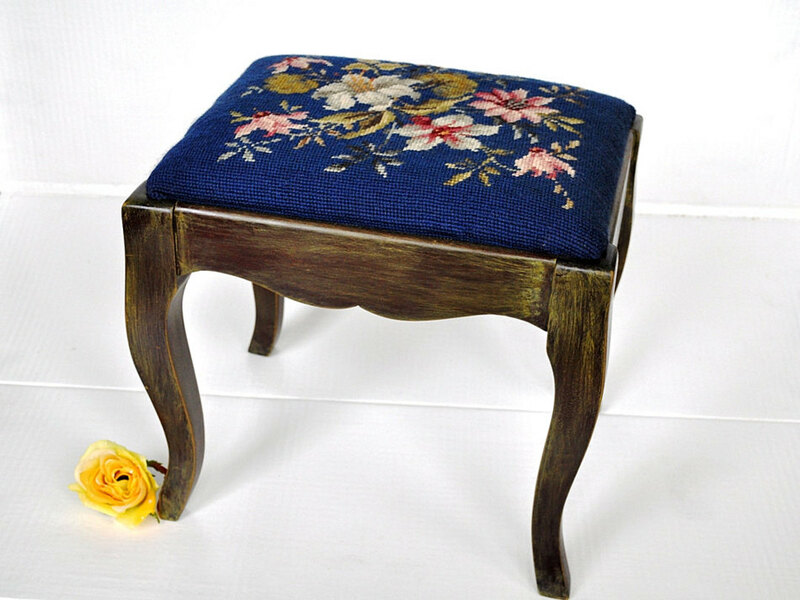 Some had needlepoint tops and Queen Anne legs. So why am I so interested in footstools and hassocks today? Because I bought this one today at the Tattered Angel for $22. I am going to change the upholstery, but will probably just put paste wax on the wood and leave the worn finish. In the 1970's, my family became a Lazyboy family, and suddenly footstools became scarce. I sell furniture four days a week, and we sell very few footstools. 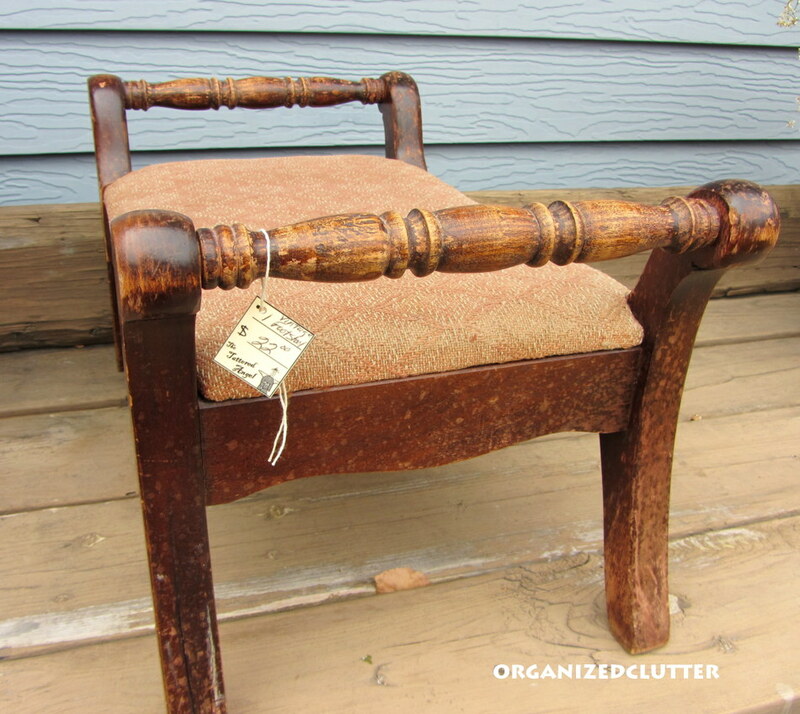 Mostly recliners or chairs with matching or coordinating ottomans that are much larger and higher than the old footstools/hassocks of yesteryear. 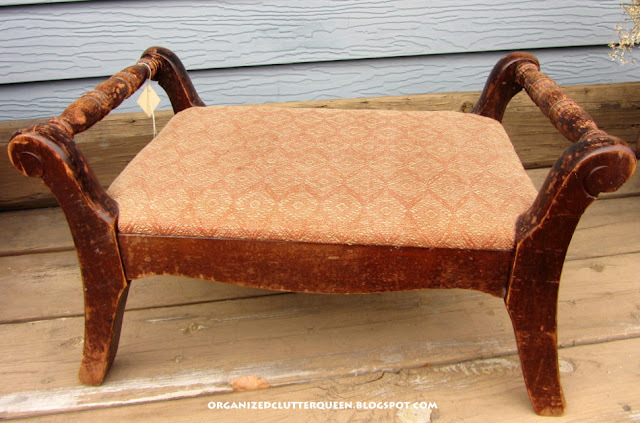 Are you a recliner family or chair and ottoman family? No recliners in my house nor when I was growing up...I guess we did our reclining when we went to bed. We weren't big on watching t.v. either. I have several foot stools/rests though that I've picked up for $3 or less with hooked wool tops. I guess I was lucky because when I got mine no one seemed interested in them. Your $22 price tag made me feel really good that I got them when I did! LOL! Can't wait to see it after you do your magic! I love the comfort of laz-e-boy chairs BUT they end up breaking down AND they leave nasty marks on the carpet. I am so ready to go to chairs and ottomons. Love the one you bought. I'm an ottoman person. 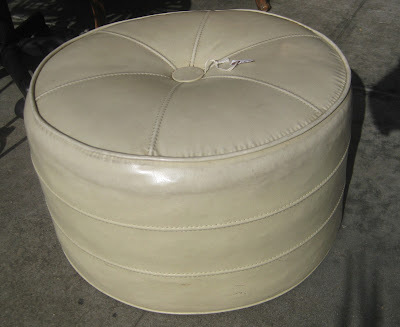 I have fond memories from childhood at my best friends' house with their ottomans. They were sisters and they each had one of the cube or round ones (the memory is getting fuzzy) in front of chairs in their family room. We would stand on those to dance while we watched the Monkeys on Saturdays and while listening to 45's. 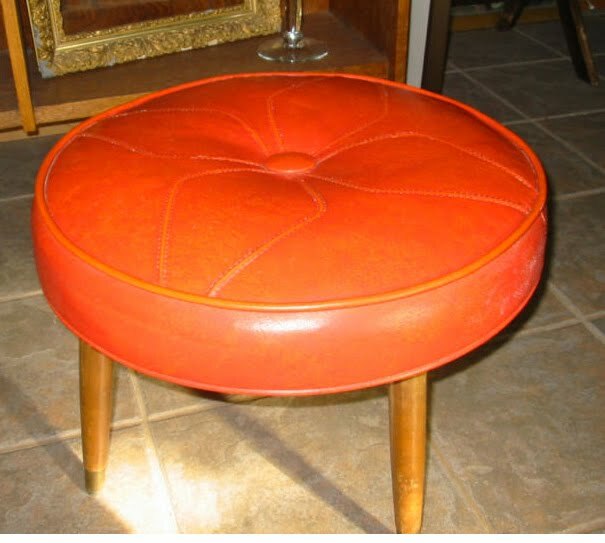 We didn't have ottomans at our house that I remember. My dad had "his" chair and he just threw his leg over the side, or we put our feet on the coffee table when sitting on the couch. Still do that. To me, that's part of a coffee table's function. It's feet on the coffee table for us too. I've got one wing back recliner with Queen Anne style legs, but where it's situated in this house doesn't allow room to recline the chair. 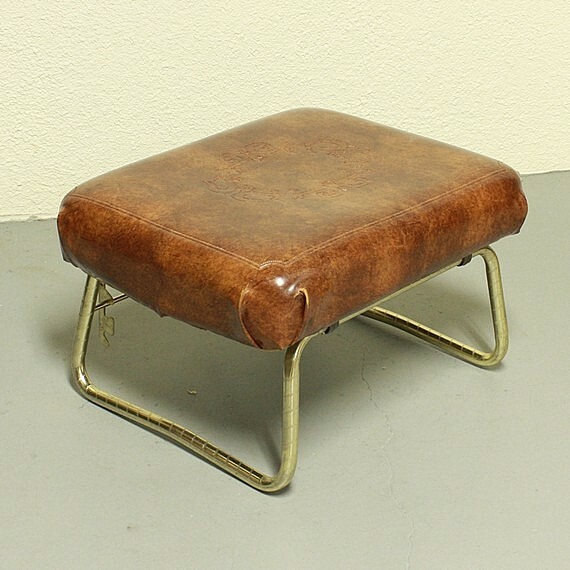 Love your sweet little footstool! I am absolutely a chair and ottoman kind of gal. Recliners just make me think of old people. lol! Like I'm so young. Love your new find! Can't wait to see it made over. 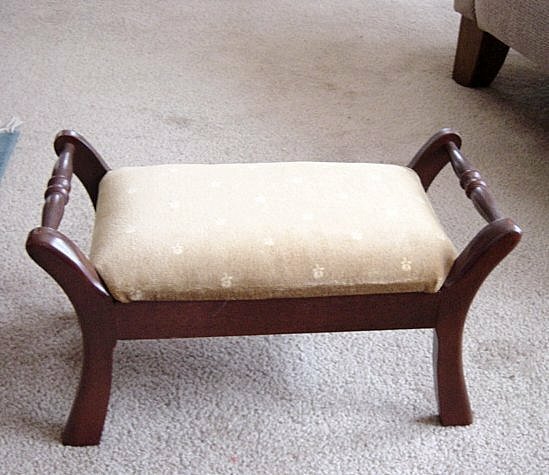 I bought the frame of a footstool at a thrift store back in April. Been going to buy some foam and cover with some of my bird fabric that I made my kitchen blinds out of. Thought I would paint the wood aqua. Have I done it? That would be a big fat NO. Thanks for reminding me to get er done! I have just about every one of these! In storage. I'm looking for some time to up-date and use them! Love the new addition. For awhile I used a recliner, however, low back pain became a problem and I was told to quit using a recliner. I now use a hard seated chair with a small step stool. I surely would love one as nice as yours. I'll be on the look out. I've looked for a comfortable sofa with a bench seat for years.....mom had one that was so comfortable....unable to find one I like. Thanks for sharing.